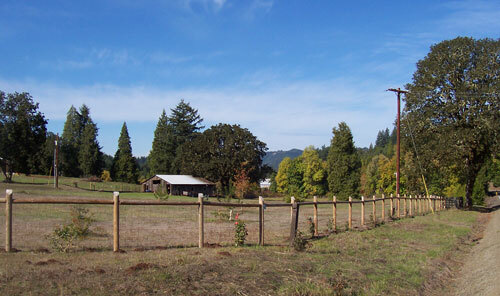 We had a front fence and gate and the pasture fence installed. 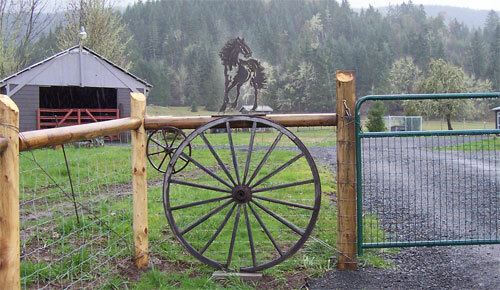 Here is the entrance to our farm. My sister gave us the old wagon wheel and good friends from Sacramento saw me off with the mustang metal cutout. 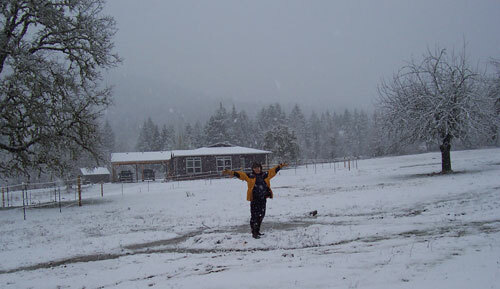 A winter wonderland! 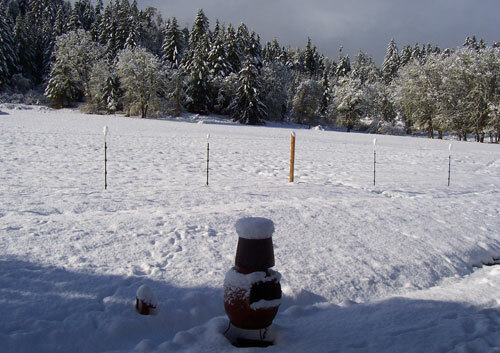 Supposedly, this was an unusual winter. 12 inches of snow and the sun comes out. 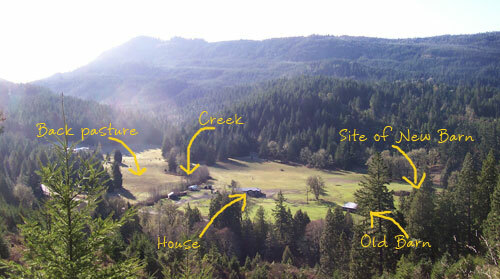 Our 27 acres. Picture taken from the hill across the street. A friend for Jerry Jeff and a nice horse for Tom. 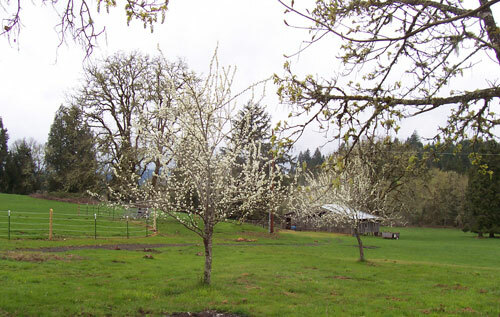 The plum trees in our front yard flowering. Not a good crop this year because it froze that night. 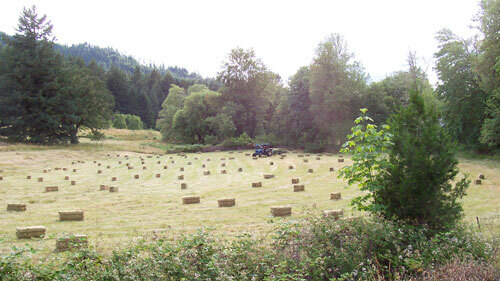 Our fields are ready for haying. The grass is green and tall! Our bottom field next to Elk Creek cut and baled. We loaded 10 tons into the barn. The bales are easy to handle 60 lb bales. A buck eating the apples falling from the tree. This fall the little bugger rubbed his antlers on the trucks of some of our new trees killing at least one. The hayman baled his portion of the hay into these big round bales. 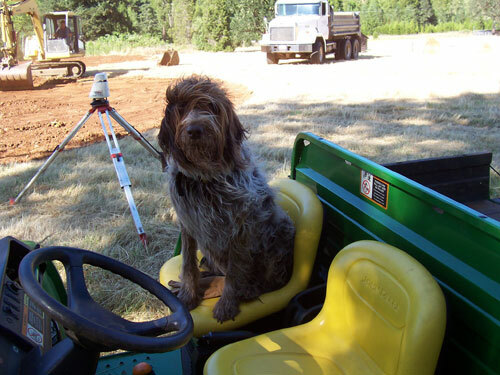 Grading for the new barn and round pen. 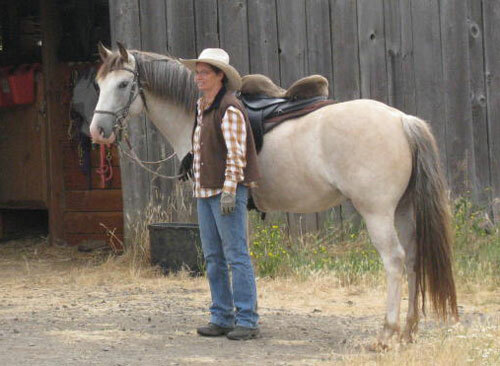 Jerry Jeff and I are all ready for a trail ride at our friends' farm . Off across the pastures heading to the logging lands. The woman and horse in the lead is my friend, Sandy, who trailered her Peruvian Paso all the way from Solvang, CA to come ride a week with us. 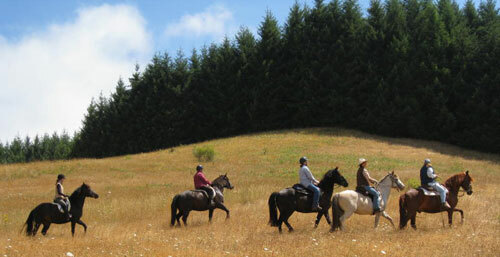 The black horses are all Canadian horses bred at Storybook Farms. The climbing roses are trying to grow on our front fence. We have been battling the deer and the gophers. 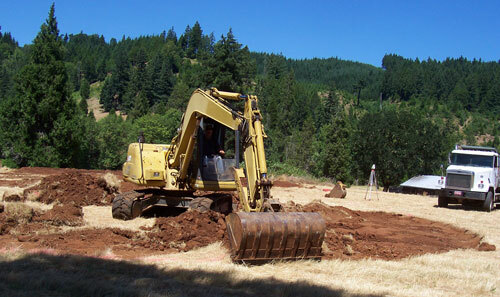 Finally, construction on the new barn begins. Putting up the clearspan header for the horses' run-ins. 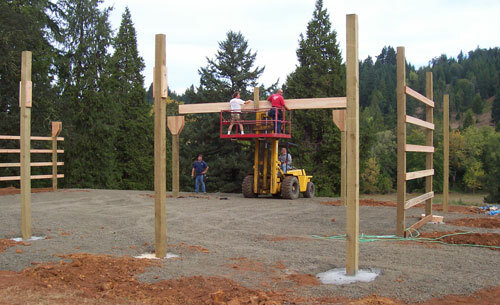 Placing the trusses for the roof on the barn. 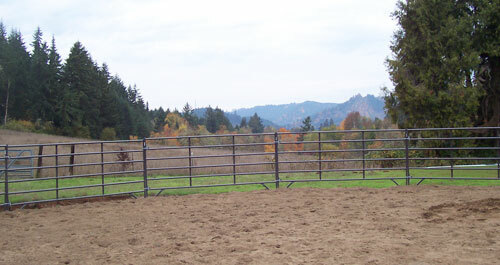 View from the pasture. 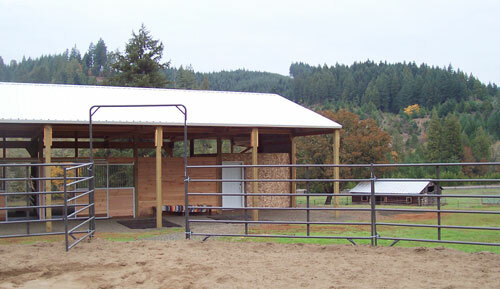 New round pen beside the barn. 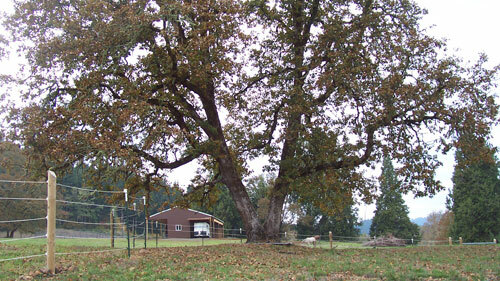 The barn is situated on a knoll in the sun and hopefully, it will drain well in the winter. Barn Done! Trailer moved in. Barn has two 24x24 run-ins for the horses. 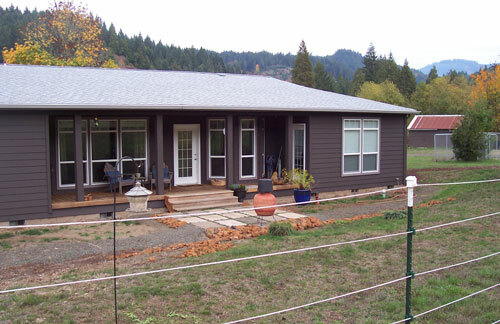 The black tank is where we will be collecting the rainwater off the roof. Right now the barn has neither water or electricity. The "working" side of the barn. 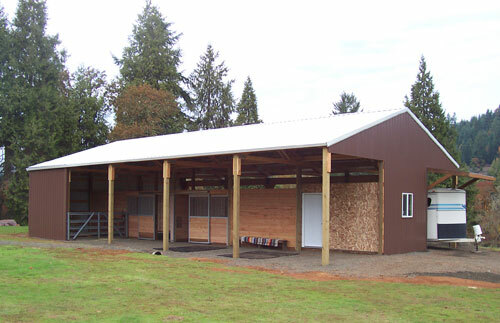 The center-front 12x12 section is the tack room. The wall will be painted brown next spring when the weather warms up again. The back corner will house hay and grain. Picturesque view of new barn taken from path from the house. 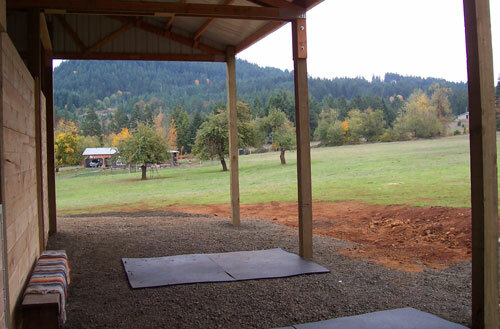 Veiw from the center of our new round pen looking north. The old barn houses the hay from the fields that were hayed in June. The view from round pen looking west across our neighbors' fields. In the summer the sun sets over those mountains. 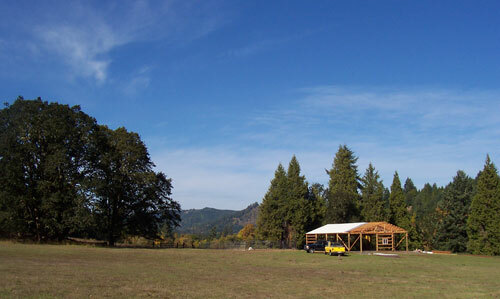 View from working area of barn looking east. Last night I met three raccoons peering out from holes in the old apple trees in the pasture. 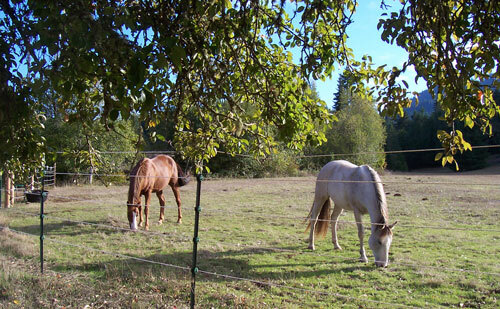 The horses enjoy the fallen apples all summer long also. Fall colors. And we finally got the house completely painted. Added the back patio this summer. Steve (my brother) and Tom laid those heavy concrete squares. They were left over from an area where previous owners worked on their cars. 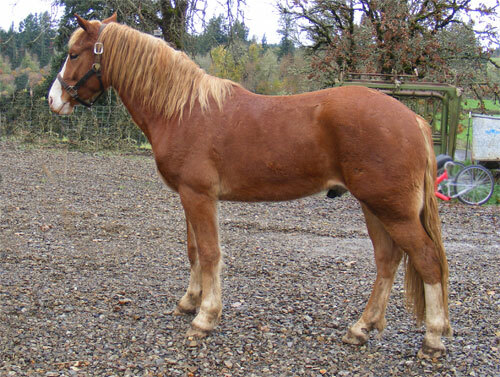 My new horse. 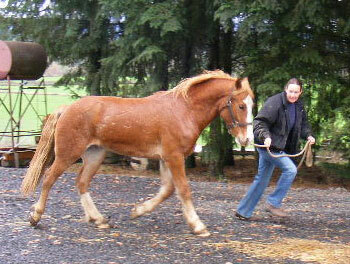 Two year old Welsh Cob. He is going to be stunning when he matures. A little dirty and a bit beat up from his pasture mates at the moment. 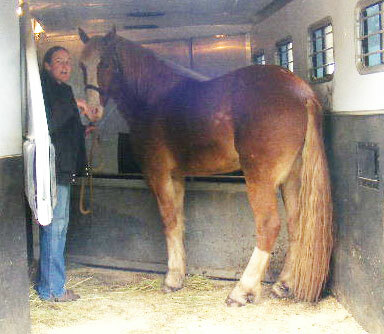 At the trainers..learning to stand, and load and unload in a trailer. Life on the farm is peaceful and satisfying...all the animals and the humans are very happy here. We had a tough year in that both my parents passed in March and Tom's brother passed in June. They are deeply missed. Next year we are planning to get our garden and tree nursery started, and put more fences up. We sure are lucky to live in such a beautiful place. Once again, please come visit anytime. Warmest wishes to you all.